“Uma’s essay showed a deep understanding of the impact young voices like hers can have in our political discourse. As she joins me next week to be a part of this annual ceremony, I hope she has the chance to share with other leaders her generation’s vision for building a better and more prosperous future,” said Murphy. WASHINGTON – Today, U.S. Congresswoman Stephanie Murphy announced fifteen-year-old student Uma Menon of Winter Park, Fla. as the winner of her State of the Union essay contest. Launched earlier this month, the contest provided high school students from Florida’s Seventh Congressional District with the opportunity to attend the State of the Union address by submitting a 500-word essay on the importance of youth civic engagement. Murphy, who was recently elected chair of Future Forum, an influential group of young House Democrats who advocate for issues and opportunities important to younger Americans, is using this historic occasion to elevate the voices of young people in her district. Menon’s essay, which was reviewed by a group of local educators, focused on the historical importance of youth-led movements, including in the current political debate. She will attend President Trump’s State of the Union address on Tuesday, February 5th at 9:00 P.M as Murphy’s guest. 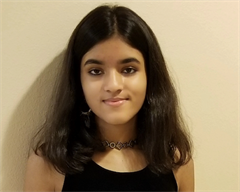 Menon is a junior at Winter Park High School, where she is an AP Scholar with Distinction and is part of the school’s International Baccalaureate (IB) Program. She serves as vice president of her school's speech and debate team and is nationally-ranked in Lincoln-Douglas Debate, receiving a Special Distinction from the National Speech and Debate Honor Society. Uma is also a published writer who was recently named the winner of National Poetry Quarterly's High School Contest. Her first poetry chapbook was published in 2019 by Zoetic Press. She also studies piano performance and music composition at Rollins College Community School. Menon is also extremely engaged in her community. She is a Florida Regional President for the Future Business Leaders of America, a member of the Winter Park Youth Leaders Class XVII, and a Student Senator for Winter Park High School's IB Program. She also serves as a student advisor for CollegeBoard's Access to Education Youth Council and has been engaged in activism on issues such as gun control, net neutrality, and support for marginalized groups. She is passionate about making a difference in the world and hopes to serve her country through a career in public service. Some mornings, I throw a political t-shirt over my head before I walk out of the house. An equality shirt when I'm feeling powerless, a reform shirt when I want change, or maybe a candidate’s shirt on election day. These small acts make me feel powerful regardless of my age and allow me to express my beliefs to make a change. Those mornings, I leave the house with pride and without fear of reprimand, thanks to student activists who came fifty years before me. After all, it is because of the young students who led the Free Speech movement and unabashedly wore black protest bands that I am able to wear political t-shirts, express my beliefs, and assemble with other students at school today. Over the years, civic-minded youth activists have created formidable change, whether it was through the landmark Tinker v. Des Moines Case, or through the more recent Never Again MSD (Marjory Stoneman Douglas) movement. U.S. Congresswoman Stephanie Murphy represents Florida’s Seventh Congressional District in the U.S. House of Representatives, where she serves on the influential House Ways and Means Committee. The district includes all of Seminole County and much of northern Orange County, including downtown Orlando, Maitland, Winter Park, and the University of Central Florida. Previously, Murphy was a businesswoman and college instructor who also served as a national security specialist in the Office of the Secretary of Defense where she received numerous awards, including the Secretary of Defense Medal for Exceptional Civilian Service. Murphy lives in Winter Park with her husband and two children.